Vessel of Interest | наблюдаемое судно: The Canadian Forces may be ignoring a nuclear waste problem they may have in Goose Bay. Are you afraid to post these stories here? I hope you will be fine. Another avenue of research that may turn up some more info is to try to find out which USAF Munitions Maintenance Squadron (later redesignated as Munitions Support Squadron) was located at Goose Bay. It was likely just a Detachment rather than the full Squadron, but the Dets were still part of an MMS or MSS and numbered accordingly. For example, the 425th MMS (later MSS) had Dets across Canada at the two BOMARC missile sites and the three Voodoo fighter bases, as well as another Det at the FOL at Val d'Or. In 1993, I went through the 425th's monthly, quarterly, and annual reports during a visit to the Air Force Historical Research Agency at Maxwell AFB, Alabama. When reading the reports, it becomes very obvious very quickly that an MMS/MSS is dealing with "special weapons" rather than conventional ones. They didn't have to say "We have nukes here" for it to be clear if they did. A USAF order of battle for Goose Bay specifically or for the USAF region in general would list the assigned MMS/MSS. 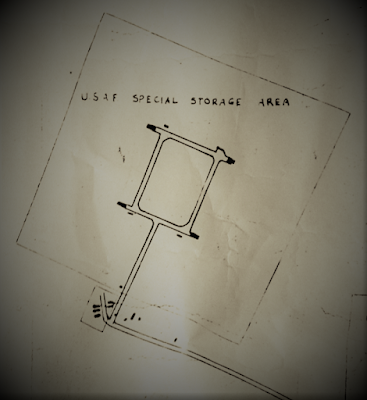 IMO, the presence of SAC-standard nuclear weapons storage facilities with their double fences and the general political climate of that time with bombers armed and airborne at all times makes it inconceivable to me that there were never any nukes there, but getting Uncle Same to formally admit it is another matter.